Each contact, depending on its type, has the option "Client Statement" or "Supplier Statement" so you can progressively view the transactions recorded in Elorus, as well as the total balance you owe or are owed by the contact. If a contact is both a client and a supplier, the two buttons described above appear This allows you to view the sales and shopping balances separately. Every contact statement page has the "Period" and "More options" buttons. The list of transactions results is configured according to the time frame you choose. Then, from the “more options” button, you are asked to choose the columns that you want to include in the contact statement. 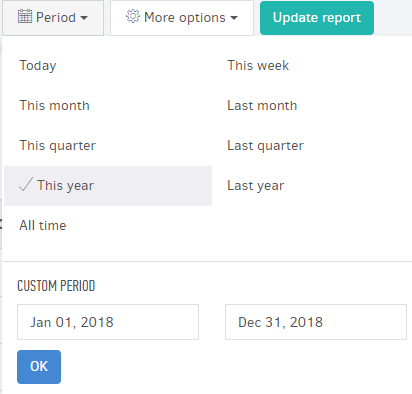 Once you click "Update report", Elorus will create a table with all the documents and payments related to the contact. You can find the sums of charges, credits, and the total balance on the bottom line of the table. Elorus displays results for the values in different tables for each currency (if multiple). In the image above, we see the "Euro" currency tab. The "US Dollar (USD)" is the second currency used to invoice the client. The transactions made in the second currency can be viewed by one click on the currency name. In addition, you can sort the results by date and type of documents by clicking on the name of the corresponding column. Finally, you can save the contact statement to a PDF or Excel file so you can send it by email or print it. Just click on the "Export" button found at the top-right of the page.